This is the first in a three-part webcast series called The Lean Series. In this first event, we'll look at how people react when they are hit by good ideas out of the blue, when they least expect them. Many people ignore them, while entrepreneurs may act on them. But acting on ideas is not without a cost. 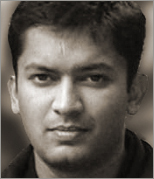 Ash Maurya (@ashmaurya) is the founder of USERcycle. Since bootstrapping his last company seven years ago, he has launched five products and one peer-to-web application framework. Throughout this time he has been in search of better, faster ways for building successful products. Ash has more recently been rigorously applying Customer Development and Lean Startup techniques to his products, which he frequently writes about on his blog http://www.ashmaurya.com, and which turned into a book: Running Lean. Ash resides in Austin, Texas, with his wife, two children and two dogs.